A charming group of barn conversions, Pitt Farm Cottages is located in the picturesque coastal village of Branscombe in Devon. It is the idyllic location to enjoy a self catering holiday in an area known for its outstanding natural beauty. Our clients were keen to utilise both RHI payments as well as fuel cost savings as a result of conversion to help improve their profitability. One of the key future requirements was the easy billing of their tenants. Pitt Farm Cottages was keen to convert their system of heating oil to a reliable technology that will offer long term fuel cost savings whilst being able to reap the rewards of RHI payments. The owners at Pitt Farm Cottages were keen to replace their heating system to one that runs on wood chips. The client wanted to use the fuel cost savings and RHI payments to help improve their profitability. A key future requirement was the easy billing of tenants. 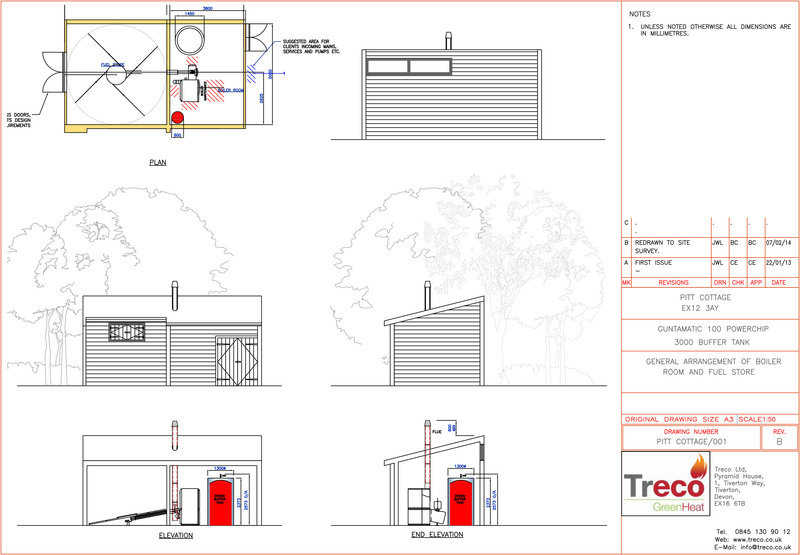 Working with our partner Wye Valley Energy, Treco installed a 100kW Guntamatic multi fuel biomass boiler, a complete fuel delivery system and a 3,000-litre buffer tank in the plant room as well as a 70m underground heat main. We also ran the heat main to connect all of the buildings included in the district scheme. In each of the property, a Heat Interface Unit (HIU) was also fitted which offers all of the controls such as a timer, a thermostat and an RHI-compliant heat meter. As there is no combustion occurring at the point of use, the HIUs do not need an annual safety check. The ultrasonic heat meter which has was included in each property forms the basis of easy client billing. Under our guidance and calculations, Pitt Farm Cottages was responsible for the construction of the boiler house and fuel store. A 100kW project of this size would expect to receive Renewable Heat Incentive (RHI) payments of £11,038 or more a year and to gain a fuel cost saving versus oil of 50%-80%. The fuel cost savings and RHI payments combined will deliver a payback on the capital cost of the equipment in five to six years.